PinkyPiggu: Hokkaido Izakaya @ Tanjong Pagar ~ For That Boisterous Japanese Izakaya Experience! Hokkaido Izakaya @ Tanjong Pagar ~ For That Boisterous Japanese Izakaya Experience! Was on my way to Hokkaido Izakaya for dinner when I bumped into a friend who was queuing for Tendon Ginza Itsuki (both restaurants are neighboring units along Tanjong Pagar Road). "Please let me know if it's good". Chloe, if you're reading this, the dining experience at Hokkaido Izakaya was agreeable in most parts. Overall, it's worth a visit. Though izakayas are essentially Japanese casual drinking joints and Hokkaido Izakaya does carry an extensive beverage list of wine, sake as well as beer, the focus here is also very much on food which feature quality produce directly sourced from Hokkaido, namely the cities of Yakumo, Akkeshi, Furano and Kamishihoro. The freshness of its seafood, the superb quality of its beef and vegetables, the creaminess of its diary products, all these are condensed into two different menus, one served during lunch and another expanded one for dinner. My eyes were instantaneously drawn to the charcoal grill section! Ooh look at those chicken wings getting their golden tan over the burning flames. I WANNA EAT YOU! Favoritism aside, the other dishes which are categorized into appetizer, salad, sashimi, signatures, rice & noodles and a host of ala-carte items well-deserves our attention too. For instance, unique starters such as Cream Cheese Marinated with Miso ($7) and Scallop Liver ($9) are not something which we get to see on the dining table very often, especially the latter which is a seasonal item. It took me a while before I mustered enough courage to pop a piece of those scallop liver into my mouth. Liver is generally fine with me but having it raw really tested my level of acceptance. Surprisingly, its smooth texture, and a dip into the fragrant sesame sauce made it easier to accept than I thought. Another off-the-menu special not to be missed is the Hokkaido Wagyu Roast Beef ($25). Adequately-marbled and lightly-seared to a melt-in-the-mouth bite, It was simply delish! If Hokkaido Izakaya is serving this dish at time of your visit, do not hesitate. Just order it! You will probably be as pleased with these slices of beef as we did. And not forgetting those Cucumber with Salted Konbu Seaweed ($5) which made such a crunchy, refreshing accompaniment. Potato Salad ($9) is typically served chilled in most Japanese restaurants, but we found a warm rendition here. The deep-fried to crispy, irresistible indulgence Potato Croquette ($8) also uses these premium Hokkaido crop. We tried three dishes from the charcoal grill, with the sweet and fresh Scallop (10) being most memorable. Both the Smoked Salmon Belly ($15) and Chicken Wing ($6) were unfortunately a tad on the dry side, with some parts overly charred resulting in a slight tinge of bitterness. The wings could perhaps do with a bit more marination as well. The appearance of Japanese Omelette ($10) brought much egg-citment to the table! Those who have tried our hands in making these layered roll eggs would know how difficult it can be to achieve that desirous moist, fluffy consistency. Hokkaido Izakaya got it nailed down completely. It could be due to the fact that milk is added as well, making the omelette so wondrously creamy. Not to mention that dallop of melting Hokkaido butter that was spread over the warm egg roll just before serving. Some of us find it a little bland though, perhaps more seasoning beforehand will do the trick. 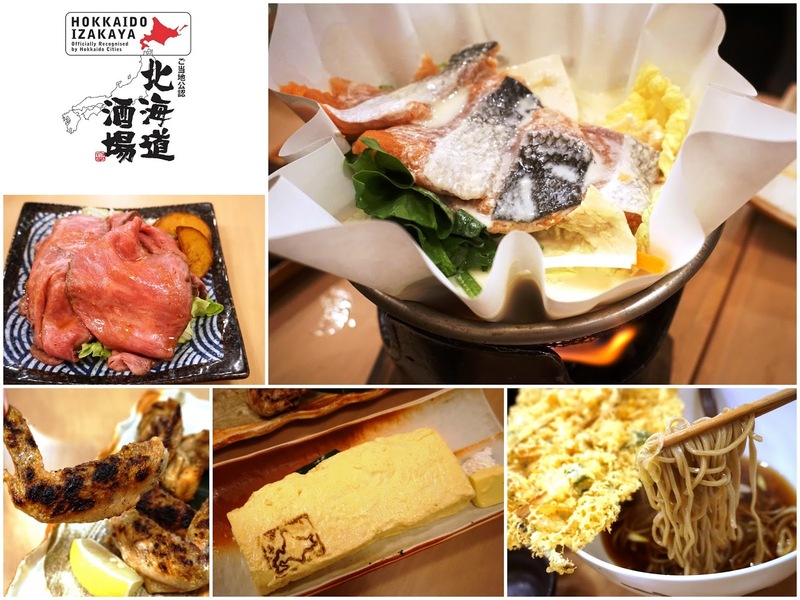 Hokkaido is well-known for its dairy products, and their best quality milk is showcased in the Milk Hotpot with Salmon ($18). The flavor of the milk shined brilliantly, making this savory-sweet broth such a slurpilicious treat to have. Other ingredients seemed to have taken a backside lol. For lunch, Hokkaido Izakaya serves up their signature soba in various options such as Kakiage Tempura Soba ($12), Traditional Cold Zaru Soba ($10) and Cold Soba with Simmered Meat ($15). Visually, the Kakiage Tempura Soba itself was quite a stunner with a huge piece of deep-fried vegetable and shrimp tempura served "floating" over the bowl of soba in hot bonito broth. Sad to say this, but the kakiage tempura suffered from the lamentable fate of being a hard and tasteless calorie-waster. Those luscious strands of buckwheat noodles which are handmade in the restaurant were undoubtedly the highlight. Expectantly, dinner ended with dessert, but what was unexpected was the uncommon combination of Steamed Potato with Vanilla Ice Cream ($7). The contrast of hot and cold topped with azuki beans and butter seemed strange initially, but found acceptance as my palate grew accustomed to its unconventionality. Seating might be a bit cramped but I guess that's close to what an authentic Japanese izakaya experience should feel like. I like the boisterous atmosphere at Hokkaido Izakaya! This is a great place to gather with friends and colleagues!